Jackie Buxton is a writer, editor and teacher of creative writing. Jackie used her experience of an aggressive form of breast cancer to inform and dispel some myths about a cancer diagnosis via her popular blog: Agenthood and Submissionville. These posts became the frame-work of self-help memoire, Tea & Chemo (Urbane Publications, November 2015) which has a five star rating from over 75 reviews. 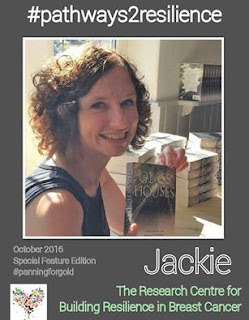 Jackie’s first novel, Glass Houses, has been recently published and is about two women's stupid mistakes, the ramifications and the silver linings. When not writing or reading, over-seeing house and teens, Jackie can be found running, cycling or tripping up though the beautiful Yorkshire countryside.